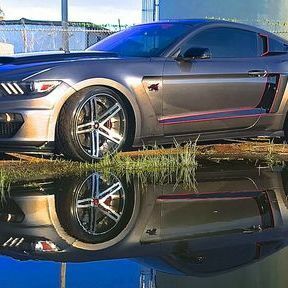 The Finest Mustang Emblems available ANYWHERE!! If you are looking for unique, multi-color and custom badges designed specifically for your car? Well then you have come to the right place!! We have the ability to customize each coyote emblem to your color choice to match your car, any car, even with custom paint. The color choices are only limited to your imagination. We have access to paints from PPG, DuPont and House of Color to name a few. 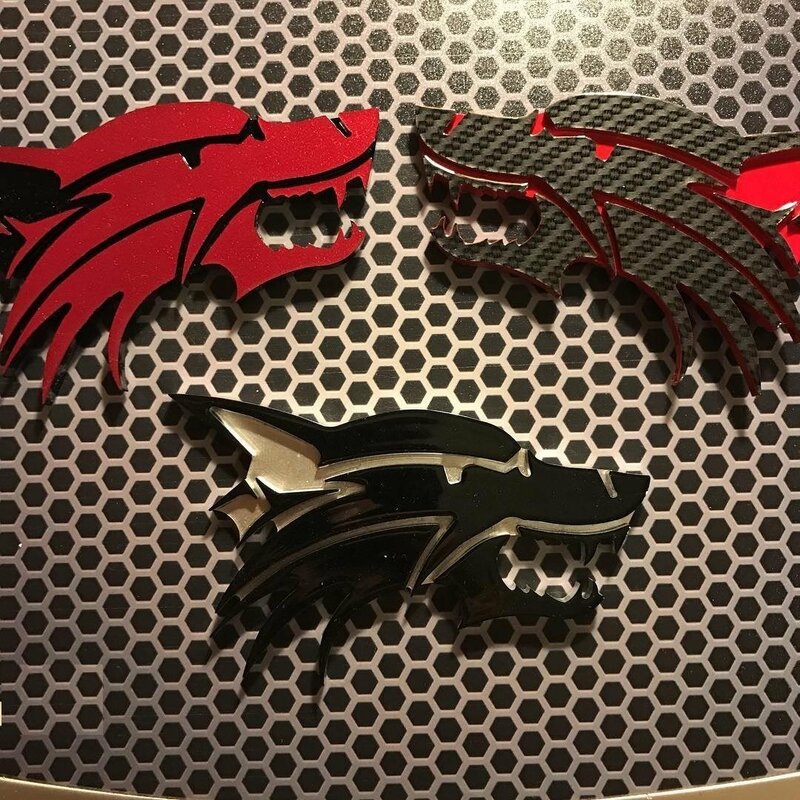 We can use any color code provided by our customers request. .
Each coyote emblem is CNC cut from high grade acrylic. The emblem is then painted to the customers requested color choice. Our most popular colors are Ruby Red, Race Red, White and All Black. We also have Grabber blue, Completion Blue, Guard green and Liquid Blue to name a few... All of the emblems from Coyote Emblems will come with the world's finest 3M double stick backing to allow you to attach them almost anywhere! We will give you a professional looking emblem painted to your color choice. We carry two size emblems. We have a fender badge and also a larger emblem for the rear deck of the Current S550. Custom sizes are available, just ask. All Products are Copyrighted to Coyotemblems. Shipping is included on all domestic orders. International orders require extra cost please pay attention to the shipping... we want to provide a great service and product... we will be happy to ship international with the proper information and pricing! Each emblem is made to order and ALL SALES ARE FINAL... NO REFUNDS will be given due to the custom natures of EACH ORDER! If you are looking for a unique, multi-color and custom product designed specifically for your car? Well then you have come to the right place!! We have the ability to customize each coyote emblem to your color choice to match your car, any car, even with custom paint. The color choices are only limited to your imagination. We have access to paints from PPG, DuPont and House of Color to name a few. We can use any color code provided by our customers request. We can also make custom sized emblems. Need a large picture sized emblem for your wall? Yeah, we can do that. All of the emblems from Coyote Emblems will come with the world's finest 3M double stick backing to allow you to attach them almost anywhere! We will give you a professional looking emblem painted to your color choice. We carry two size emblems. We have a fender badge and also a larger emblem for the rear deck of the Current S550. Custom sizes are available, just ask. We also carry the GT350 style badge for the grill but can be used in any location as you choose. Like on our fender badges, they are available in any color combo you choose. Dare to be different is the norm for my life to say the least.... My goal was and is to present a unique and different look for the Coyote design concept. An aggressive yet simple design that provides limitless color options for the customer to choose from. Your imagination is your only limitation. Our blueprint was hand designed and based on an tribal design that allowed for a 3-D highlighted emblem. Our passion for working on cars and or trucks, especially the Ford Mustang, and tattoos inspired our product. We wanted to offer items that could be customized easily at the same time giving that unique edge that separates you from the crowd.